Jaipur is one of the most popular cities among the travelers and tourists in India which is not surprising as it is a part of the golden triangle consisting of Delhi, Agra, and Jaipur. The palaces, forts, heritage Havelis, bazaars, and shopping is a big lure for travelers to visit Jaipur. Given the number of tourist attractions in Jaipur, it is difficult to squeeze them all in one day. With the number of destination weddings, business conferences and conclaves happening in Jaipur, a large number of people visit the pink city on a tight schedule leaving little time for the sightseeing. Visiting Jaipur and not being able to explore tourist attraction is a letdown. With a plethora of choices, people often get confused about places to visit in Jaipur in one day. This Jaipur travel blog will help you with the must-visit places in Jaipur in one day. Jaipur was founded in 1727 AD by Maharajah Sawai Jai Singh II and it is one of the first planned Indian city, popular the world over as the Pink City. Initially, Amber or Amer was the capital of this region called Dhundad. It is at a distance of 11 km from Jaipur. The need for shifting the capital to Jaipur arose because of increasing population of Amer and scarcity of land. Maharajah Sawai Jai Singh II wanted to grow his capital into a great trading hub, therefore, he decided to build a new one close to Amer. He consulted several astrologers and city planners before finalizing the layout of the city. The layout of Jaipur was guided by the ancient art of Shilp Shashtra. After the founding of Jaipur, he invited leading traders, Brahmins and artists from all over the country to settle in his new capital. This explains why even today Jaipur is a leading center for Jewelry, hand block print fabrics & clothes, and handicrafts. It wasn’t always pink ever since was founded. The color pink was chosen when Edward Albert, the Prince of Wales was visiting Jaipur in 1876 AD. India was then a British colony. The king of Jaipur, Maharajah Ram Singh II thought it will be a welcome gesture to paint the city with a single color, not knowing that this shade of pink will stay on forever. Before choosing this shade he got all markets painted in different colors as an experiment but ultimately, the color pink was chosen. The “Jaipur Pink” is actually a terracotta pink. Amer Fort is the most popular tourist attraction in Jaipur and is a UNESCO World Heritage Site. It is 10 km from Jaipur and it’s actually a palace and not a fort. Its grandeur is spellbinding. Its architecture is a beautiful blend of Rajput and Mughal architectural styles using both marble and sandstone which are found locally. It was recently included in India’s top 17 iconic tourist attraction by the Indian Ministry of Tourism. Amer Fort Elephant ride is one of the highly coveted experiences of this medieval fort. There are many things to see here and it takes a minimum of 45 minutes to complete the tour of the palace section. Don’t miss Ganesh Pol, Sheesh Mahal, Sukh Mahal, and Zenana. Do read the complete guide to Amer Fort in this post – The only guide you will ever need for Amer Fort. Read: 5 Reasons why Amer Fort is the most popular tourist attraction in Jaipur? Tip for Amer Fort. Take elephant ride on your way up. Don’t be surprised to encounter a long queue for the elephant ride during peak season! Beat the rush and reach early! Amer Fort Timing: The Amer Fort opens at 8 AM. It’s best to reach the elephant stand around 7.30 AM. Jaipur City Palace is a royal abode; the residence of Jaipur royalty. It was built by Maharajah Sawai Jai Singh II. Descendants of the royal family still reside in City Palace. However, some of its parts are open for tourists to explore. It’s located right in the heart of the city, close to Hawa Mahal. Things to see in Jaipur City Palace includes beautiful courtyards, painted gates, and museums. Not to be missed are Mubarak Mahal and Pritam Niwas. Peacock Gate is the most popular attraction of Jaipur City Palace. Tip for City Palace! Best time to visit the city palace is post lunch, you don’t have to walk around much. Its located very close to Johari Bazar, so commuting is not a hassle. Don’t miss two huge silver urns made by Maharajah Sawai Madho Singh II to carry the holy water of river Ganga during his trip to England in 1902. Each of them weighs 345 Kg!! It’s a must see! Jantar Mantar is one of its kind solar observatory in the world! It was built by Maharajah Sawai Jai Singh II in1738 AD and is still fully functional. The instruments are still precise. It’s a UNESCO world heritage site. It has the world’s largest sundial. Maharajah Sawai Jai Singh had keen interests in both maths and astronomy. He did extensive research of the works of Portuguese and Arabs in the field of astronomy before building Jantar Mantar. Jantar Mantar is a part of Jaipur City palace complex but it is run and maintained by government department and there offers entry through composite ticket along with Amer Fort and Albert Hall Museum. Overlooking Jantar Mantar solar observatory and City Palace, Jaipur. Tip for Jantar Mantar. Don’t forget to hire a guide!! Without a guide, it’ll be difficult for you to understand how each instrument functions. It takes 30-45 minutes to complete the tour of Jantar Mantar. Hawa Mahal is synonymous with Jaipur. Its unique in terms of its design & beauty; an architectural marvel. It is popular the world over as The Wind Palace and was built in 1799 AD by Lal Chand Ustad, commissioned by Maharajah Sawai Pratap Singh. This iconic building is five-story tall and features 953 windows! It served as a screen for the royal women as they watched the processions or life on the street. The facade of Hawa Mahal is actually its backside! The entrance to the building is from the opposite side. If you have time, do explore the entire structure. However, If you are short on time, a selfie with Hawa Mahal will do!! Tip for Hawa Mahal! There are 953 windows in Hawa Mahal called Jharokhas in the local language! By the way, all the shops around Hawa Mahal sell tourist-oriented stuff like garments, bed sheets, souvenirs etc. You will find only commercial quality in these shops. Bargain hard before you seal a deal. There is a famous and reliable shop near Hawa Mahal for hand-block-printed fabrics – Gulab Chand prints! It sells quality Jaipuri & Sanganeri hand-block-printed salwar suits, dresses, and shirts! It’s a small, congested “busy” shop but hugely popular among locals and tourists. Tourists at Hawa Mahal, a famous tourist attraction in Jaipur. Nahargarh Fort is extremely popular among the locals, especially youth. Nahargarh Sunrise and sunsets experience is highly sought after. 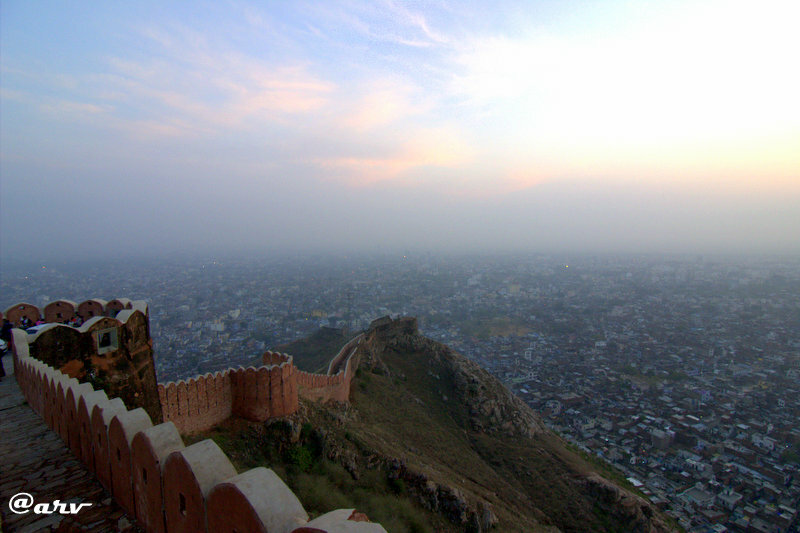 The fort covers a huge area and overlooks Jaipur city. It’s been restored beautifully. The Madhavendra Palace is its main attraction and contains 12 identical quarters. It was a residential complex for the queens designed in a way that King could access any of them discreetly. It has also served as a jail for a brief time; only VIP’s were detailed here. The Stepwells of Nahargarh Fort are quite popular. In fact, one of the famous Bollywood movie Rang De Basanti was filmed at Nahargarh Fort Baori. Tip for Nahargarh Fort! The palace section closes at 5 PM. Visit Nahargarh fort around 4-4.30 PM. After visiting Madhavendra Palace section, head to the open air Padao restaurant and enjoy the sunset & city views. This restaurant is run by RTDC – Rajasthan Tourism Development Corporation. It serves only beer and snacks. The amazing views are the best way to end your Jaipur trip. It won’t be a problem if you wish to leave at 7 or 9 PM. Do note there is no public transport service or taxis available for your return trip from Nahargarh Fort. Arrange for your pick up well in advance or ask for the cab to wait for you. Start early with Amer Fort followed by Hawa Mahal and Jantar Mantar. This should set you free by 1 PM for a lunch break. To save time, you can have lunch in Baradari, Jaipur City Palace. You can check it out in detail on Zomato. After the lunch break, visit City Palace followed by Nahargarh fort. Post-Nahargarh Fort, you can visit old bazaar of Jaipur for shopping. Hawa Mahal – 10 minutes for street side view/ 30 minutes to explore the entire structure. Nahargarh Fort – 30 minutes-45 minutes for Madhavendra Palace. This sets you free to spend time at Padao restaurant, and wind your day at your pace! TIP! You can avail a composite ticket for Amer Palace, Nahargarh Fort, Jantar Mantar, and Hawa Mahal. It’s a good deal. Valid for two days! Jaipur is a popular shopping destination offering a huge variety in all that it offers. Here is a short guide to shopping in Jaipur Bazaar. Bapu Bazaar for hand block print fabric and clothes, Jootis, bangles, salwar suits, and bed sheets. Feel free to tinker around with this Jaipur travel itinerary of places to visit in Jaipur in one day. 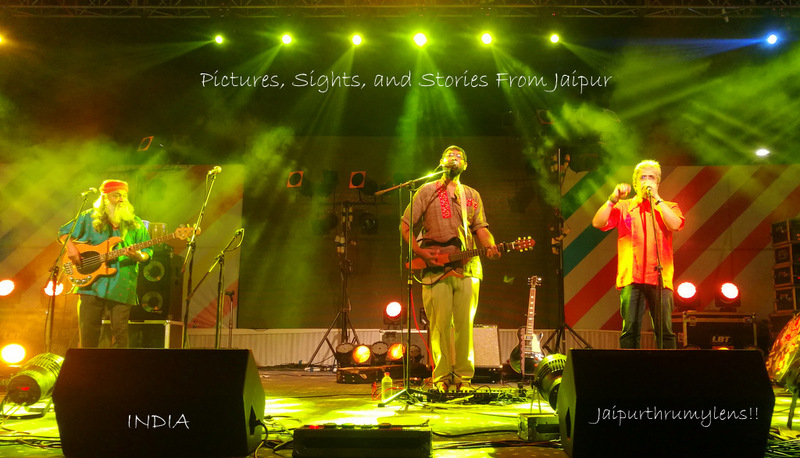 This travel guide on Jaipur is not suggested for summer months (March to June) when the scorching heat makes it difficult to explore tourist attractions in Jaipur during the daytime. This is a great comprehensive guide to Jaipur. I love architecture and the buildings look so beautiful. My husband and I have talked about going to India at some point in the future, and visiting Jaipur should definitely be on the list. I’m taking note of all of your Jaipur travel posts. Many of my husband’s co-workers travel to India for work, and I wouldn’t be surprised if he travels there one day (along with me 😉 ). As usual, your photos are amazing and your posts are very informative. Great post! Thanks Erin, I’m sure you both will love Jaipur. The city ranks high on travelers list because it offers quite a lot. So where are you based, Erin? Beautiful photographs! I’ve been to Amer fort thrice – it’s so beautiful! But, on my last visit, I was sad to see they had closed off most of the rooms due to vandalism. I really wish people would have more respect for our history and culture! Indeed, that’s sad. I have already posted few pictures and even a post to raise this issue. It’s a persistent problem across all monuments in India. It’s unfortunate that our youth instead of being bold enough to express their feeling to the person chooses walls. You should read of my post – Why our attitude towards heritage needs to change? Yes, Ophira! They are. Have you explored India? I have a whole sets of pins on Jaipur thanks to you! Someday I will get to visit and this will be my guidebook. Stunning pictures and well done written thanks for sharing and keep it up thanks a lot ! No one can tell better than a local guy from Jaipur telling you about his experience. The places you have mentioned are quite good. Beautiful and informative once again! Arv, thanks for such a beautiful guided virtual day trip of Jaipur. It was like revisiting the city with you. 🙂 What a wonderful and helpful post.